Lee, R. "The History Guy: Comics History"
Copyright © 1998-2011 Roger A. Lee and History Guy Media; Last Modified: 08.09.11--This copyright notice covers the written text and written analysis and historical descriptions on this page. All fictional characters mentioned on this page are the property of Marvel Enterprises or DC Comics. As a long time comic book fan, I must admit that when I heard about DC Comics' planned relaunch and reboot of their flagship titles, I was a bit perturbed. To see such venerable titles as Action Comics, Detective Comics, Superman, and Batman, all with their long-running numbering system and history of continuous publication go by the wayside was a true disturbance of the force, to borrow a metaphor from another franchise. However, curiosity got the best of me, and I bought the digital version of the new Justice League series last night. 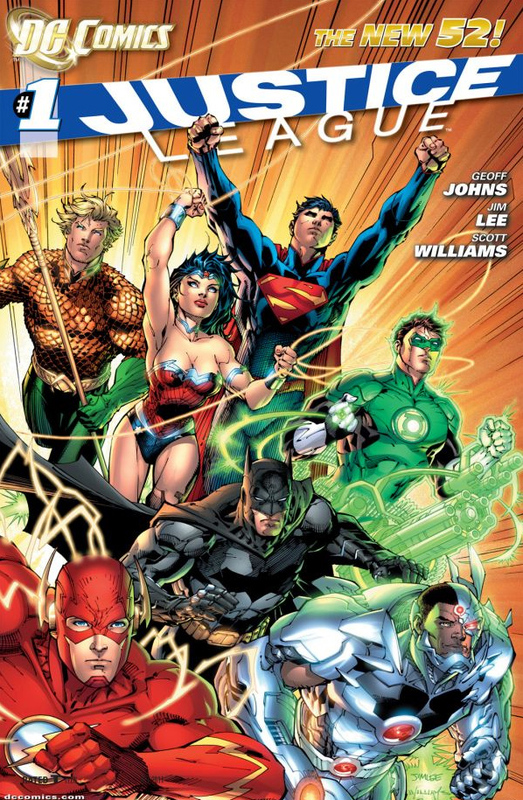 Of the 52 titles DC is relaunching, Justice League #1 is the first to reach publication. As I opened the new comic on my laptop computer, what before my wondering eyes did appear, but the colorful cover art of the new Justice League. And, it appeared, that these familiar heroes looked slightly different than the old, now discontinued JLA members I recall from my youth (or even from last year). The story is by Geoff Johns, with the illustrations by Jim Lee. DC brought out their big guns for this relaunch, and they got it right! In this version of the DC Universe, the heroes we associate with the old Justice League have not yet met, and the public and the government do not consider them to be heroes. The story opens with Batman being hunted down by the Gotham City police as the Dark Knight is himself hunting down an as yet unknown bad guy. Such is the level of animosity the authorities have for the Caped Crusader, that when police commander is informed that Batman is pursuing a super powered being, the order is given to "bring them both down." Of course, Bats survives the onslaught, but is surprised at the appearance of Green Lantern. At this point we realize the heroes have not met, because upon their first encounter, Green Lantern blurts out to Batman, "You're real?" Of course, the heroes team up to track down the mysterious bad guy, who Green Lantern is tracking because he is an extraterrestrial. As Green Lantern explains a bit about himself, Batman seems to have some disbelief in the Lantern's claim that he is part of a corps of space cops. While dealing with their elusive alien adversary, they decide to check out another alien they have heard of to see if there is some connection with the bad guy. Using Green Lantern's ring, this Dysfunctional Duo track down the other alien in question, Superman, who they know is active in Metropolis. While Batman advises caution in approaching Superman, who seems to be in an area indicative of recent super-powered combat, a fearless, and thus over-confident Green Lantern declares "I'll handle this," whereupon he is cannonballed by a blue and red powerhouse. We then see a Superman with some attitude declaring that "I don't handle easy." The story ends with a ticked-off-looking Superman facing down Batman. What I like about this new take on these old heroes is that we see the archetypical personalities and traits we know these characters for (speaking of Batman and Green Lantern here), in their most basic form. Batman is the stolid avenger who seeks out and is comforted by the animosity of society, using it as another cloak to meld into the shadows with and build his fearful mystique. We see him in detective mode, as he surmises the means by which Green Lantern utilizes his ring (that part is really funny! ), and we see Batman as ultimately sneaky and ruthless. Green Lantern, who the mythos tells us was chosen to wear the ring because he is without fear, is certainly fearless. And, as a byproduct of that lack of fear which makes him a powerful Lantern, we see that it, along with the incredible power of the ring, makes Green Lantern an arrogant, careless fool who gets "taken" by the other two heroes in their own unique ways in this tale. GL does not look good in this version the DC Universe. We do not see enough of Superman in this issue to truly analyze him, other than to get the feeling that he has a tad bit of attitude, and may not like other costumed types in his territory. I liked the characterizations of Bats and the Lantern in this issue. I only see two real negatives in this new Justice League. One, which I already mentioned, relates to the whole idea of the reboot, at least in terms of ending the original long-running franchises and starting the numbering of the comics back at #1. The other negative is that the plot line of these costumed heroes being fugitives from the law (as a result of their vigilante work), is stolen (er, I mean "borrowed" from the Marvel Civil War and the Superhero Registration Act of a few years ago). Been there, done that! Overall, and despite the negatives just mentioned, if DC is going to reboot things, then Justice League #1 (2011) is pretty darn good, and worth the read. Plus, I bet this new League is a setup for the future Justice League Movie. I hope! Buy this comic. It was fun.